Still the gold standard widely available Barbera d’Alba. 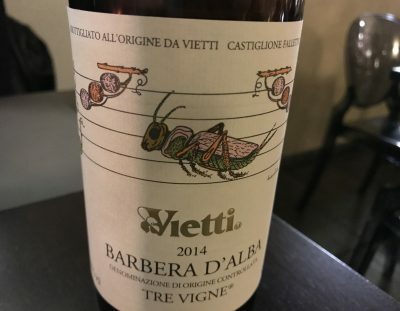 ’14 was a tough vintage in Piedmont, though harder in some of the higher vineyards rather than the lower spots around Alba (and Barbaresco). Indeed this manages to tap into that endless black fruit of ripe Barbera, but stops with a sudden descent into acidity. Initially a straightforward wine, that thick blackberry fruit dominates from the start and deliver satisfying flavour, the acid propping up the finish. Enjoyable, direct Barbera if just a little hollow to be an absolute superstar. Best drinking: 2017-2022. 13.5%, €28 off a list. 17.5/20, 91/100. Would I buy it? I’d share a bottle.